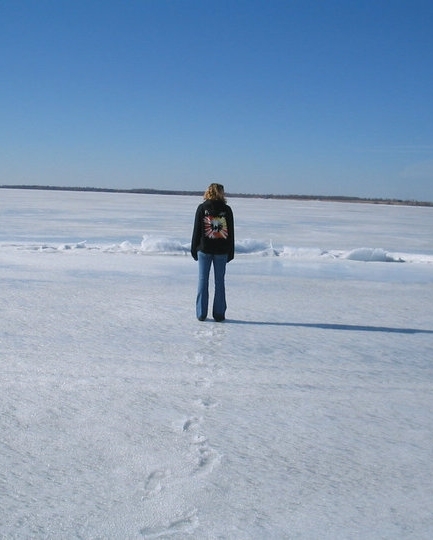 Checking the ice on the St. Lawrence River. 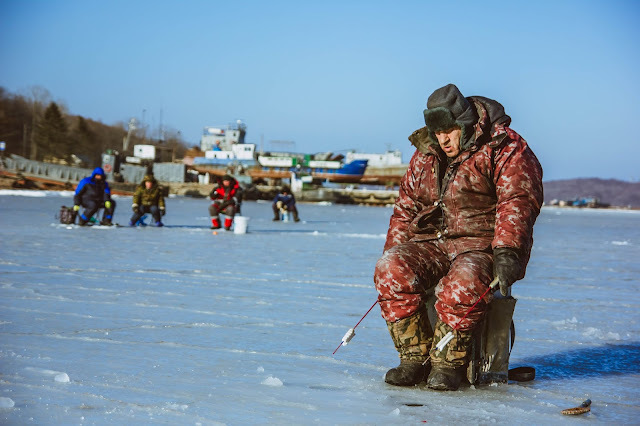 The thought of ice fishing conjures up images of people huddling together in freezing temperatures trying to catch fish through small holes in lake ice. Most of those who have never experienced ice fishing tend to mentally file it under the “most unpleasant outdoor activities ever” tab. However, ice fishing aficionados can’t get enough, which wouldn’t be the case if the misconceptions were all true. 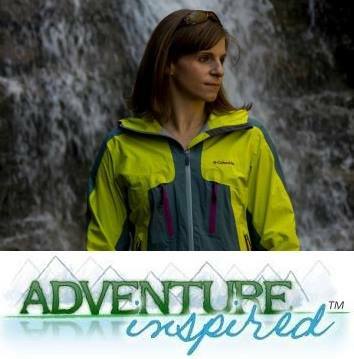 It's a pursuit I've wanted to try for a while now, and I'm grateful to today's guest post authors for helping me debunk a few myths about this super unique winter activity! Myth #1: No one ever catches many fish while ice fishing. Although it’s certainly true that it’s possible to hit a bad patch of luck while ice fishing, that’s the case with fishing in general. Because fish travel in schools, once you hit a sweet spot, it’s possible to catch several fish in the course of a few hours. Technology can help ice fishers hedge their bets. Portable fishfinders show what’s going on underneath the surface of the ice, allowing ice fishermen to make good choices about where to drill their holes. Fish don't hibernate or slow down during winter. Also, choosing an ice fishing lodge with experienced guides enhances the chances of a successful fishing sojourn on the ice. They’ll know where the fish are most likely to be biting and be familiar with various species-specific strategies for getting them to bite. Myth #2: Ice fishing isn't going to be any fun unless you look like these guys. Another major myth surrounding the mysterious world of ice fishing is that isn't something everyone can enjoy. However, an ice fishing trip can be family-friendly time, and it can also serve well as a nature-based romantic interlude for two. Ice fishing is whatever the participants decide to make it — including a traditional guys-only getaway with plenty of beer, soft drinks, coffee, hot chocolate or whatever else the crowd desires. Image courtesy of Straight North. No matter what the dynamics of the group, ice fishing trips provide an excellent way to make memories and promote bonding among family and friends. Delicious and nutritious dinners made from fish caught in cold, clean waters are perhaps the best part of any ice fishing trip. Myth #3: You're guaranteed to be miserably cold while ice fishing. The thick ice necessary for successful ice fishing wouldn’t be there if outdoor temperatures weren’t well below freezing, but the activity itself doesn’t have to leave participants miserably cold and numb. Wearing cold weather gear such as snow pants and snow boots is recommended, as is dressing in layers topped by a warm winter coat. Myth #4: Ice fishing is super dangerous. It's easy to see why many people believe that ice fishing is a dangerous activity — after all, who wants to risk being suddenly plunged into freezing water in the middle of a lake in the wilderness? However, done correctly, ice fishing entails very little risk of such a thing occurring. 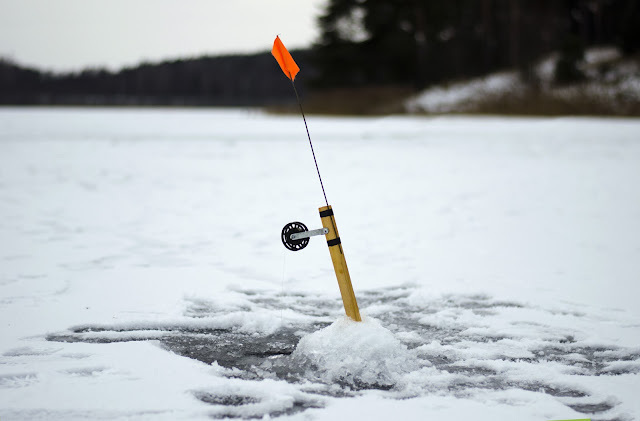 The ice should be at least 4 inches thick before setting up an ice fishing station. Using a chisel on the ice can determine whether it is sufficiently sound. If the chisel goes through the ice easily, it's an indication that the ice isn't thick enough for ice fishing. Properly checking the ice before each trip is an essential component of successful ice fishing. Even if an ice fishing station has been set up on a particular spot the day before, conditions may have changed just enough in the course of several hours to cause the ice to become unstable. Ice that creaks, cracks, snaps, crackles and pops is often thought to be unsafe. However, these noises often occur when the ice is in the process of expanding as it becomes thicker. Melting ice, on the other hand, makes no sound at all. Huge thanks to Dave and Sheree Swistun for sharing their expertise with us! Dave and Sheree are owners of Duck Bay Lodge, a fishing resort located in Lake of the Woods, Ontario, Canada. Built more than 60 years ago, they are the fourth owners, having purchased Duck Bay Lodge in 1988. If you're looking to try ice fishing, look for high-quality lodges that specialize in winter fun. Nothing against ice fishing I would like to try it. But it's never going to be as comfortable as wading or boating the bays and beaches along the Gulf coast in Texas even in the winter time it hit's the 80's some days.